I try to pay attention when this crazy life slows down just enough. Tiny themes. Parables. Accents to the usual ebb and flow of a day. Today, as I was looking around my room, I came across one of those tiny themes. Which, for me, is sort of odd. I’ve really been into flowers lately. I realize that isn’t the most masculine or insane thing of me to say, but at this point, I don’t really care too much about that. Being a sucker for aesthetic, especially in the dining room, I’ve grown to love those floral notes and little bursts of pigment and how they make a room (and me) feel more alive. This week, I received a portrait of a magnolia. My state’s flower and tree, believe it or not. I love magnolias. My favorite tree in the world has its roots dug in the front yard of my Me-Maw and Paw-Paw’s house — the giant magnolia that we used to climb as kids. Lately though, the magnolia has become a symbol to me in another way. Healing. I look to it as a place that I came home to slow down and feel okay for a while. To me, the magnolia is my home place. It puts me at peace, and I’m always looking for peace in small and big ways. Being a sucker for making dishes pretty, I bought a packet of nasturtium seeds to plant. 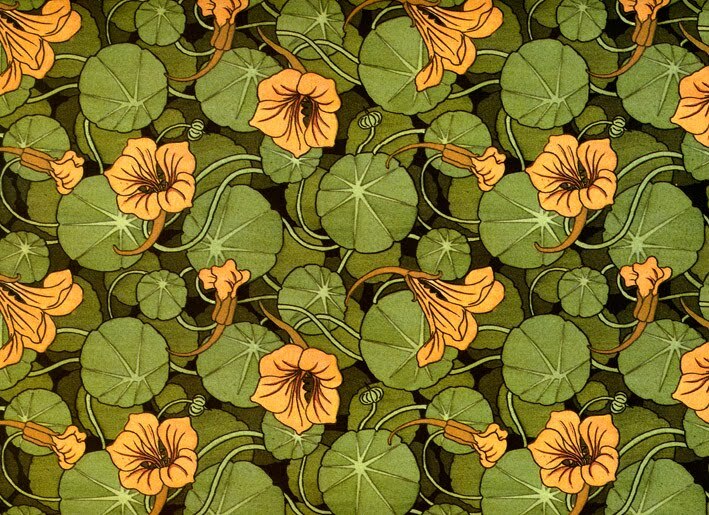 Nasturtiums are these lovely and colorful little flowers that are in fact, edible. I know that might weird people out, but I think they’re just dandy. I think we should be eating more of them, to be honest. I know it’s a little dorky to put flowers on food, but for the sake of my craft, I’m just gonna go with it. At work, I’ve made a new friend. Her dad grows flowers, plants and herbs and sells them at the local farmer’s market. I told her I didn’t have enough hands for them this past Thursday, so she brought some flowers to me in the midst of a leaning stack of dirty dishes in a stuffy kitchen. It completely made my day. I see them sitting on my nightstand, looking very alive and unique, greeting me in the morning time. I could make this a habit. Most people who know me, know of my deep love of St. Francis. Albeit a very popular saint, I consider him mine. I once had a shaman tell me that he saw St. Francis near me one day. I can’t say that I fully believed the dude, but it gave me chill bumps. I learned a lot about St. Francis when I lived in India for a short time. I have these tattoos on my wrists that help me remember how inter-connected our world is. I have Francis to thank for that. Well, and a scruffy tattoo artist who worked out of a pawn shop in Jackson, Mississippi. The Little Flowers were stories released after the death of St. Francis. I suppose it all brings me to feel a bit more holy in a tumultuous time. Faith to me feels a bit like swimming in a choppy ocean. A lot of ups and downs and treading, but ultimately surrounded by it all. I like that we have little stories of faith, little reminders of miracles, and a way that we remember the tiny things that live among us. As I watched the birds land on my new feeder, they would dig their beaks into the mound of seeds and shower them on the ground for all the other little birds. I can say that I’ve been on both ends of that, and recognize its importance. In some seasons, you are the one casting seeds, in the other you are sowing, and perhaps at the end, you get to see the fruit of your labor and give thanks with your fellow Beloved. I am writing today because of so many people, and their daily works and thoughts and efforts. for the small things, with great amounts of love. Isn’t it funny how flowers are considered feminine and therefore, to many, a negative or awkward thing for a man to enjoy? That somehow if something is not what societal norms consider to be “masculine” is therefore lesser? I’m noticing a lot of subtleties in language these days so just something I noticed as my husband, who is the flower guy in the family while I’m the fruit/veggie gal, said something similar the other day. Nice to see another man as well whose let go of the norms to do what he loves! The comment on nasturtiums also reminded me of dandelion greens and the saying about weeds being “but an unloved flower” – we eat apples which start out as flowers, yet if we eat flowers it is somehow segregated from “normal” food. Interesting eh? Life is always in those beautiful details…we look back and those are our memories. Lovely to see you are continuing to create new memories in the everyday of life.